The School of Dental Medicine seeks to enroll students with the academic background, personality, and motivation to enjoy and profit from our educational program and to become the best possible dental practitioners. Since the University is committed to selecting a student body representative of society at large, students represent a diversity of backgrounds and interests and come from a variety of undergraduate colleges. Many have had significant full-time work experience prior to applying to dental school. As the only public dental school in New England, the School of Dental Medicine participates in the New England Regional Program and gives preference and reduced tuition rate to residents of Connecticut and the rest of New England. However, non-New England residents are admitted each year and are encouraged to apply. All applications are given a thorough and holistic review as expeditiously as possible. In general, each applicant is expected to have completed the equivalent of four years of college and have a baccalaureate degree by the time he or she enters the School. In unusual cases, an exception may be made for an applicant with a minimum of three years of college. Specific requirements for admission include one year (two semesters) each of general chemistry, organic chemistry, biology, and physics, as well as one semester of Biochemistry and facility in English. Courses in cell and molecular biology and genetics are strongly recommended. 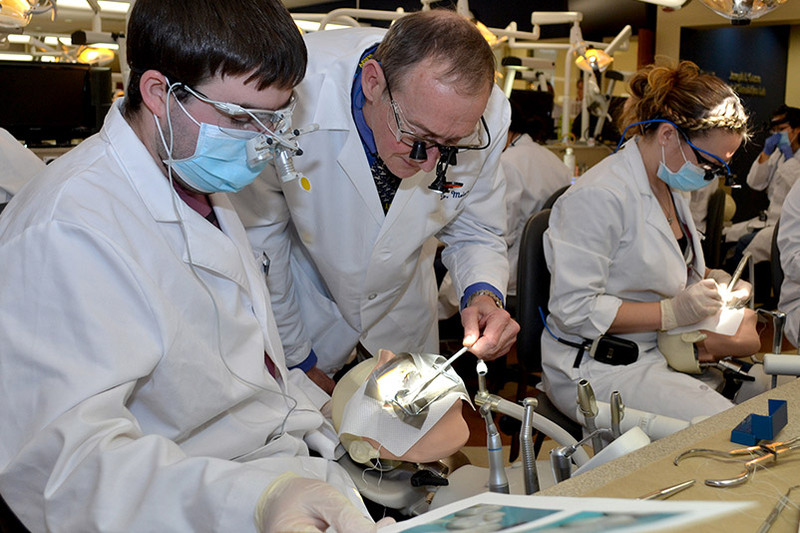 As the only public dental school in New England, the School of Dental Medicine participates in the New England Regional Program and gives preference and reduced tuition rate to residents of Connecticut and the rest of New England. However, non-New England residents are admitted each year and are encouraged to apply. What is the average GPA? DAT total science? For initial review you should have a science GPA of 3.2 and a DAT total science score of 19. Over the past two years incoming students have had an average science GPA of 3.5 and DAT total science score of 21. Does the school accept out-of-state residents? If so, how many? Typically 50-60% of each class is composed of Connecticut residents, with another 30% from other New England states and the remaining students from other states. How many applicants apply each year? How many are accepted? During the 2013-2014 application year approximately 1,300 applications were received. Of these, 160 were interviewed and offers were eventually made to approximately 80. Does the School accept the Canadian DAT? December 1 of the year of matriculation. It is advisable, however, that you complete your application prior to November 1 of the previous year. What are the requirements? Do you need a degree? Is it possible to transfer after the second year? Minimum requirements are: 1 year general biology with lab, general chemistry with lab, organic chemistry with lab, and physics with lab. A semester of biochemistry is also required. Recommended courses: cell biology, and molecular genetics. Over 99% of matriculated students have at least a B.S./B.A. degree. The School does not accept transfer students at this time. Do you offer a program for foreign trained dentists? There is no special program for foreign trained dentists for 2014-2015. What are the tuition and fees for in-state and out-of-state students? Please refer to the Tuition and Fees page. When should supplemental materials be sent? The application fee of $75 USD fee can be sent at any time. You do not need to wait until your AADSAS application is received. How many letters of recommendation are required? I've been out of school for a while, are employment letters of recommendation acceptable? Three letters of recommendation, preferably from a pre-health advisory committee are required. While the Admissions Committee prefers letters of recommendation from faculty, other sources (employers, dentist, etc.) are acceptable. Does age of applicant make a difference? Age is not a factor in the admissions process. The average age of a typical entering class is 24. Do you ever waive the $75 application fee? The School of Dental Medicine will consider an application fee waiver if the applicant's college/university bursar/financial aid officer documents need. If reapplying do I need to resubmit documentation? Do you have my original AADSAS application? Individuals who reapply must submit an updated AADSAS file. The School of Dental Medicine will keep all records for a period of one year following a submission. Do you have a secondary application? The School of Dental Medicine does not require a secondary application. Call Tricia Avolt at 860-679-2175 or email dentalschooladmissions@uchc.edu. The School of Dental Medicine curriculum is designed to provide students with a comprehensive educational experience that allows them to master the knowledge and requisite skills associated with the practice of general dentistry. Gain an understanding of the basic sciences related to structures, functions and interrelationships among body systems in both health and disease. Develop competency in clinical skills which include but are not limited to patient assessment, treatment-planning, patient education, prevention of oral disease, control of pain and anxiety, prevention and management of dental and medical emergencies, and the diagnosis, management and treatment of the major oral diseases and conditions. Gain an understanding of behavioral science concepts from the fields of psychology, sociology, public health and administration applied to the delivery of care and to the management of a dental practice. The curriculum consists of two major components that run parallel in a manner to both reinforce essential information and to reduce non-beneficial redundancy. 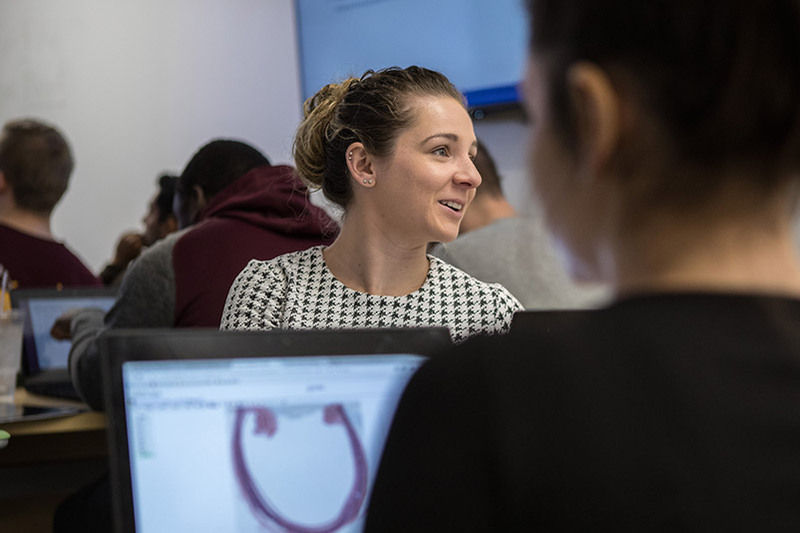 During the first eighteen months of study, UConn School of Dental Medicine students and UConn School of Medicine students join together to study the basic medical sciences through an integrated curriculum. 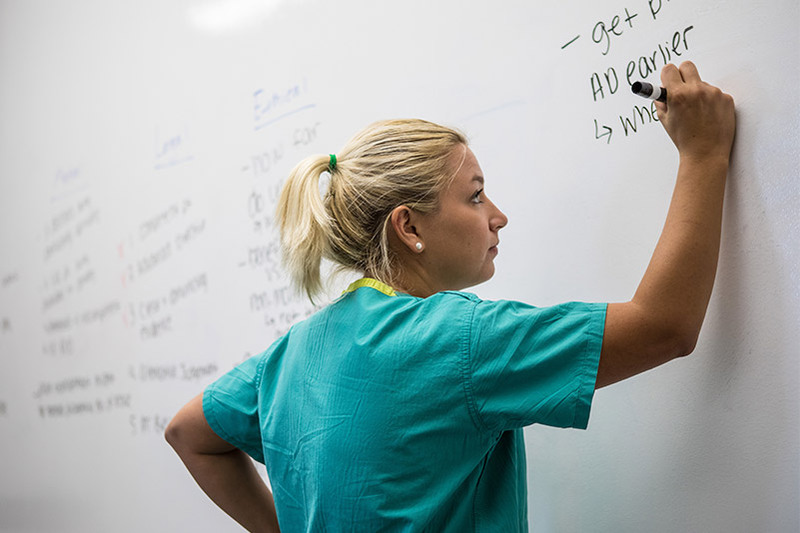 Within that curriculum, known as the MDelta Exploration Stage, dental students take four key courses and engage in additional research, scholarship and Individualized Learning Opportunities (ILO’s). The Exploration Stage is comprised of five 10-week blocks. Each block is followed by a two-week Learning Enhancement and Assessment Period (LEAP). The summer between the third and fourth block is 12 weeks, allowing ample time for research or other individualized opportunities and content reinforcement. Case Oriented Essentials (COrE): The sequence of cases through each of the COrE blocks helps the student to develop foundational knowledge in biopsychosocial science through the presentation of virtual patients and families. Team Based Learning (TBL) is the key pedagogy utilized in COrE, with students engaging in increasingly complex application exercises related to the content of each unit. The curriculum progresses the student toward greater independence and clinical reasoning. Fabric of Anatomy & Biology Lab (FAB Lab): The laboratory experience includes Gross Anatomy, Virtual Anatomy, Histology, and early exposure to Radiology and Ultrasound in both the Human Anatomy Lab (HAL) and Virtual Anatomy Lab (VAL). The goal of the Laboratory program is to provide students with fundamental knowledge of the anatomy and microanatomy of all clinically relevant regions and structures within the human body. This knowledge will inform their physical examination and clinical reasoning skills. Students will learn to correlate state-of-the-art medical images with anatomy and to recognize pathological changes associated with anatomy. Elements of a team-based approach to learning are also integrated into the FAB Lab blocks. Vertically Integrated Teams Aligned in Learning and Scholarship (VITALS): Longitudinal teams of students join their medical student peers to learn together and teach each other critical, timely material across the spectrum. The content includes such topics as bioethics in the news, emerging diseases, health care policy and social determinants of health. These sessions support students’ future roles as research-based practitioners, patient educators, and life-long learners. Delivery of Clinical Care (DoCC): Students will learn the necessary skills to interact with and examine patients, and will be provided regular feedback for ultimate growth as a professional. Dental students learn the essential aspects of clinical patient interactions and the application of certain foundational biopsychosocial principles during the first block of the Exploration Stage. Individualized Learning Opportunities (ILO’s): Students will have the opportunity to pursue elective experiences, work on educational projects, participate in service learning, and explore the intersection of the humanities with medicine, research, global health programs, and other areas to enhance their personalized learning experience. ILO’s take place following exams during each block’s LEAP period. Each curricular area address subjects with scientific and/or clinical commonality and consists of two or more integrated courses. The goal of the Growth, Development and Aging curriculum is to provide the student with knowledge of the normal structure and development of the oral cavity and craniofacial complex, abnormalities of craniofacial development and psychosocial development in relation to the oral cavity and its impact on dentistry. The treatment and management of the pediatric and geriatric patient, and the diagnosis and treatment of malocclusions and other orthodontic problems are also emphasized. The Oral Physiology and Anatomy curriculum includes instruction in basic and applied physiology and histology of oral tissues and in dental anatomy/tooth morphology. Topics include the role of the sensory and motor systems in the oral cavity as they relate to mastication, swallowing, salivation, speech, taste and smell. The Dental Morphology section focuses on the characteristics that comprise the gross anatomy of the human dentition including the anatomic structures of the individual teeth as well as their supporting structures. The Oral Diagnosis and Clinical Medicine curriculum provides comprehensive instruction in the areas of oral and physical diagnosis, oral and maxillofacial radiology and oral pathology. This curriculum enables students to obtain, interpret, and record a comprehensive medical and dental history and to safely manage medically and pharmacologically complex patients. Students are taught to perform thorough head and neck and intraoral examinations, recognize abnormal clinical findings, and obtain appropriate laboratory tests. Students receive instruction in ionizing radiation and learn to obtain and interpret common radiographic images to recognize normal anatomic landmarks and the appearance of periodontal disease and dental caries. This course series also covers the etiology, pathogenesis, and classic radiographic and clinic appearances of a variety of developmental abnormalities and pathological of conditions of the jaws, teeth, the sinuses, and the salivary glands. Operative Dentistry: The Operative Dentistry course gives students an understanding of the basic concepts of operative dentistry, single tooth restorative treatment options, instrumentation, nomenclature, and terminology. Emphasis in this section is placed on recent advances in esthetic and cosmetic dentistry. Dental Occlusion: The Dental Occlusion course examines the relationship of the opposing dental arches as they interrelate during closure and when undergoing dynamic jaw movements. The process of mastication and the contacting relationships of anterior and posterior teeth are covered in reference to the potential restorative needs of the teeth. Dental Materials: The purpose of this course is to develop an understanding of the fundamentals of metals, ceramics, polymers and other dental materials to complement the Restorative Sciences technique courses. Emphasis is placed on the relationships between a material's structure and its properties. Fixed Prosthodontics: The Fixed Prosthodontics course covers the biological and mechanical principles of restoring diseased and/or damaged teeth with cast metal or porcelain restorations and replacing missing teeth with fixed prostheses (bridges). Removable Prosthodontics: The Removable Prosthodontics course examines the role of partial and compete removable dentures in the treatment of missing teeth and edentulous dental arches. Dental Implants: The Dental Implant course provides the student with background on the biology of dental implants and the management of implants within the scope of the general dentist. The course focuses on the establishment of a database, development of a treatment plan and the coordination of implant therapy with other specialties. Students also receive hands-on surgical and restorative laboratory experience with the ITI and Branemark implant systems. The Oral Diseases and Infections curriculum covers the general areas of cariology, periodontology, endodontology, prevention, and the principles of treatment planning. Cariology: Cariology focuses on the etiology, pathogenesis, prognosis, prevention and treatment of dental caries in humans. Emphasis is placed on microbial causation, dietary influences, tooth demineralization and remineralization, and prevention and patient management strategies. Periodontology: Periodontology includes consideration of bacteria-host interactions in inflammatory periodontal diseases, surgical as well as nonsurgical periodontal therapy, and management of both acute and chronic periodontal disease. Endodontology: Endodontology is concerned with the morphology, physiology, and pathology of the dental pulp and periapical tissues. It includes the biology of the normal pulp; and the etiology, diagnosis, prevention and treatment of disease and injuries of the pulp, and the resultant associated pathological conditions. Oral Health Promotion: The primary objectives of the Prevention of Oral Disease course are to provide students with the rationale and methods for maintaining the dentition and surrounding oral structures in good health for life. It emphasizes the ethical and intelligent care of the patient and that the concepts of prevention of oral disease are an integral part of comprehensive care. Treatment Planning: The Treatment Planning course is designed to assist the student in creating a comprehensive and coherent strategy to achieve and maintain oral health. It emphasizes the broad principles and multidisciplinary integration necessary for the development of a sound treatment plan based on the major oral and systemic diseases, associated problems and general approaches to their management. This curriculum prepares students to deal with social issues relating to healthcare delivery; laws, rules and regulations for healthcare delivery; risk management; information and business management systems; interactions among healthcare providers; and health and the practitioner. It also prepares and trains students in the areas of infection control and environmental safety. The module includes a community-based mentoring program which exposes students to the extramural practice of dentistry in order for them to experience the dental profession from the perspective of the private practitioner. Students are exposed to real-life practice situations and learn to deal with the emotional, financial and social aspects of dentistry and patient care. This curriculum provides a coordinated presentation of the traditional subject areas Oral Surgery, Pharmacotherapeutics, Pain and Anxiety Control, and Management of Medical Emergencies. Instruction begins in the second year of the D.M.D. program and continues through the 4th year, and is sequenced both with foundational instruction in the Basic Medical Sciences and with the clinical curriculum. The clinical training of students and general patient care activities at the School of Dental Medicine are conducted primarily within practice groups (teams) consisting of students in the junior and senior years. Each team includes a faculty team leader and a patient care coordinator. Staff assist students with scheduling of patients, financial affairs and quality assurance. Student providers consist of a mix of third- and fourth-year students for the majority of patient care activities. First and second-year students participate in clinic activities commensurate with their level of ability. Delivery of care is the responsibility of the team. Patients are assigned to students for examination and the development of a treatment plan. While most care is usually delivered by a single student provider, some patients may be treated by other members of the team depending on the complexity of the required care and other factors. The members of the team are responsible for the delivery of comprehensive dental care including continual maintenance of the treated patients' oral health. Evaluation of student performance is not based on rigid requirements or numerical quotas. Competency is evaluated on an ongoing basis and is determined using standard competency criteria developed by the faculty of the School of Dental Medicine. In order to satisfy some of their competencies, students participate in specialized clinics including pediatric dentistry, oral and maxillofacial surgery, oral and maxillofacial radiology, and orthodontics. 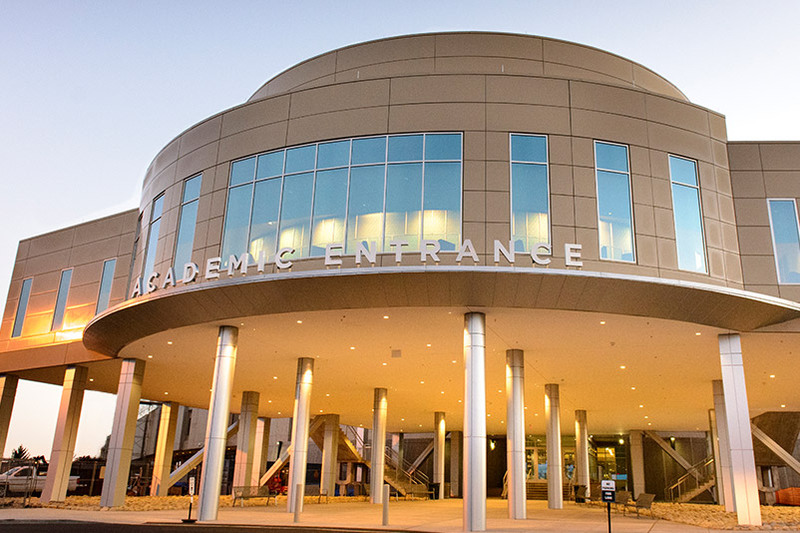 Electives are an integral part of the academic experience at the School of Dental Medicine. The electives program for predoctoral students provides a broad range of opportunities including funded summer research projects and internal and external experiences in all of the clinical specialties. Elective experiences include activities such as rotations at the School of Dental Medicine or at external sites, and public service experiences at locations in the inner city and in Third World countries. The Office of Dental Academic Affairs maintains a file of available electives. The Senior Associate Dean of Education and Patient Care oversees this program and evaluates all requests for elective experiences and helps tailor them to the needs of the individual student. To facilitate the application process, the UConn School of Dental Medicine participates in the Associated American Dental Schools Application Service (AADSAS). AADSAS transmits to a dental school the biographical and academic data required by admissions committees, thereby relieving the applicant of the need to complete multiple, repetitious individual applications. It is advantageous to start the application process as early as possible. More information may be obtained from AADSAS. Applications may be initiated as early as June of the year prior to intended registration, but no later than December 1 of the intended registration year. It is permitted to apply prior to the completion of prerequisite course work and the Dental Admission Test (DAT). The application fee of $75 can be paid online. For further information call 860-679-2175 or email dentalschooladmissions@uchc.edu. All applicants are required to take the Dental Admission Test. The test is designed to measure general academic ability, comprehension of scientific information, and perceptual abilities. The DAT is offered in a computerized format which can be taken at any time. Additional information is available from the Dental Admission Testing Program, American Dental Association Division of Educational Measurements, 211 East Chicago Avenue, Suite 1846, Chicago, IL 60611-8099; 312-440-2689 or 800-621-8099. DAT registration and test information can also be obtained at the American Dental Association website. Letters of recommendation should be forwarded from the predental advisory committee at the applicant's undergraduate school directly to AADSAS. If no predental advisory committee exists, then letters from three faculty members are acceptable. An interview at the School of Dental Medicine by invitation of the Admissions Committee is required prior to final evaluation. During the visit, an applicant will receive information about the curriculum, talk with dental students and faculty, and explore the School's facilities. All applicant files are initially reviewed by the Chairman of the Admissions Committee (Associate Dean for Admissions) for completeness of prerequisites, required documentation and evidence of minimum academic performance. Minimum academic standards, including science GPA and DAT scores, are established by the members of the Admissions Committee at the beginning of every admissions cycle. Applicants meeting all requirements may be invited for an interview. Applicants not meeting minimum Committee standards, but who show strong potential, may be granted an interview by the Associate Dean of Admissions. Interviews are mandatory for consideration for acceptance. Interviews are part of a day-long orientation that includes an overview of the School of Dental Medicine and the curriculum by the Associate Dean for Admissions. Lunch and a tour of facilities is conducted by students. All interviews are conducted by basic science and/or clinical faculty. Interviews are designed to assist the Admissions Committee in evaluating the overall potential of each candidate and suitability for admission into the program. Interviews are also used to help clarify an applicant's record and allow candidates an opportunity to ask questions. A summary of each applicant's entire record is presented to the Committee by their respective interviewers. Applicants are rated on a scale from one to three (one being the strongest) by each Committee member; the mean score from all Committee members establishes that individual's priority. Offers are made to applicants with the highest priority scores consistent with AADSAS notification date guidelines. Preference is given to Connecticut residents and New England residents during the admissions review. Applicants not receiving initial acceptances are placed on a wait list and ranked according to their priority scores. All Connecticut residents who are not accepted are invited to schedule a counseling visit with the Associate Dean for Admissions to discuss their application. Acceptances are provisional and contingent upon the applicant's maintenance of acceptable academic achievement throughout the remainder of their undergraduate program. Upon notification of acceptance, the applicant is required to make a nonrefundable deposit of $1,000 which is applied toward tuition. The School of Dental Medicine no longer accepts applications for admission with advanced standing. The School of Dental Medicine does not accept transfer students.